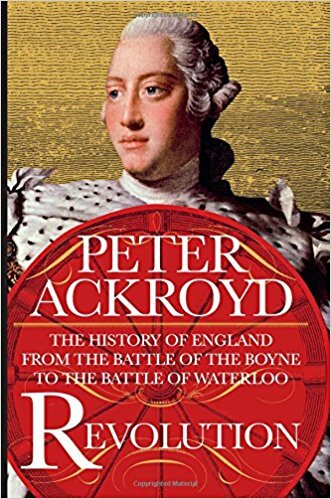 Peter Ackroyd has written about the history of England from William the Conqueror through the Regency of Prince George. His first volume, Foundation, spans spans almost four centuries from the Norman conquest to the Wars of the Roses, a lot of history to cover in a single volume. The Tudors covers the dynasty that won the Wars of the Roses, from Henry VII through Elizabeth I, who left no direct heir. Rebellion covers the disastrous reign of the Stuarts of Scotland and the interregnum under the Cromwells, ending with the Glorious Revolution and the arrival of William III. The one unifying aspect of these first three novels is how the monarchs defined the eras in which they reigned. The Plantagenets were ruthless kings descended from William the Conqueror’s granddaughter Mathilde who battled for supremacy in England and France with the kings of France. The Yorks and Lancasters battled in a bloody civil conflict the reflected England’s struggle to define itself in an era in which Normandy ceased to exist and the French throne became more an enemy than a prize. The Tudors tried to unite England and break the grip of the Church while the Stuarts served as the dying gasp of the “divine right of kings” to rule. Ackroyd’s latest, Revolution, focuses less on the kings – the final Stuarts Mary and Anne, as well as the first Hanovers – and more on the sweeping changes that engulfed England. For starters, under Anne, the thrones of England and Scotland were united. Hence the name of the Britain, the United Kingdom. His history begins with William III and his wife, Mary II, firmly in command of the nation. And not. Parliament made William king and let it be known they could unmake him. Yet the royal prerogative remained a powerful tool for the monarch through the age of Anne. It was when Anne’s nephew, George Hanover, succeeded her upon her death, that the focus of power shifted from the king to a new role in British rule: The first minister, now called the prime minister. The concept is largely the invention of Robert Walpole, and Ackroyd defines this era of English history not in terms of which George sat on the throne, but under Walpole, both Pitts, and, of course, Lord North, a man so beleaguered by America’s rebellion that he ultimately resigned pleading ill health. Perhaps the death knell for the strong monarch in England came from George III’s battle with porphyra, which rendered him mad for several spells. His son, Prince George (later George IV), would be a hamstrung regent and a weakened king as he took over for his ailing father. But Ackroyd’s focus is not merely on the rulers of the time. He also charts the rise of capitalism, the fragmentation of Protestantism in England, and the sea change in English literature and music. The England of the first three volumes of Ackroyd’s history sees day-to-day life for peasants and merchants largely unchanged since before the first Celts and Anglo-Saxons set foot on the island. In Rebellion, merchants supplant the ennobled landlords of old, tinkerers become power brokers, peasants move from the farm to the factory with results both good and bad. It’s a shift from a world that might be recognizable to fans of Game of Thrones or Outlander to the beginnings of what we know today. It’s also the dawn of the largest empire in the history of the world. One has to wonder if Ackroyd’s next volume even look at anyone in power beyond Queen Victoria, who was as much a cultural force as a political one. The dawn of the industrialist, the commoner, and the soldier has dawned by the end of George III’s life.